THANK YOU very much for your comments. If you would like others to contact you via e-mail, please enter your address in such a way that it will not be picked up by spammers. For example “jane — at — kmail.com” or something similar. Better still, allow readers to answer you here at this blog. Hi just found your site, I’m tracking my ancestors and come across a “Susannah Via”. I having a ball tracking everyone in my “family” and am finding all sorts of information that I’d never heard about. I came across your site while researching my Richardson family. It doesn’t appear that our Richardsons were kin- but I enjoyed your site even so. Would you be able to provide attribution for the quote you have posted? I have a line of Richardsons. They are from Kentucky. Winchester to be exact for some. My Great-grandmother was Cora Richardson who married Napoleon B. Devary. Were are yours from?? Maybe we are related? Jan. My GGGrandfather was napolean devary. And same for my gggrandmother was cora. I would love to see some of your research. Cora and Naploean had a son named Robert and he had children one that was my grandpa Donald. And in turn my mother Katherine. Thank you Debra. The author of the quotation is anonymous as far as I know, and I do not recollect where I found it. I found your site through the picture of the Laurel Hill Lindsay house. I just received a copy of “Lindsays of the Americas”, which has a sketch of the same house circa 1890. The front porch was not there way back when! My 5th Great Grandfather built that house, I was wondering if you had any more photos of it you could share. Great website! These were actually taken by my husband Cliff Barney, not me. I found your Website for your grandmother Larkie Bell Hackett though a Google search for Archibald Stinson in Buckingham. I was particularly drawn to Larkie’s fourth and fifth generation information. I am a direct descendent of Archibald through his son, John. (I’ve not seen Archibald’s first name listed as “John”, but it could be true.) Archibald was my Great-Great-Great Grandfather. I’ve been aware for some time that Archibald’s daughter, John’s sister, and my Second Great Aunt, Mary Susan Stinson, married into the Branch family as one of the docents at the Buckingham Museum mentioned it to me on a recent visit. I’ve been researching my Buckingham Stinson line for a long time with only modest success. My stumbling block is Archibald himself and proving that he was the father of John and his siblings: Washington, Sarah, George, David, Mary Susan, Martha, Elizabeth Ann, and Joseph. I have birthdates for all children, but no proof that their parents are Archibald and Elizabeth. I also have several legal documents that discuss relationships, but none that specifically state the parent-children relationships. Very frustrating. Do you have any documentation that Mary Susan was Archibald’s daughter? Do you have documentation that Archibald and Elizabeth were married? I’d be very grateful for whatever information you have. I’m in the process of posting a Website to show my Stinson research so perhaps I’ll have some information that might be helpful to you. I hope so. After all, we’re cousins! By the way, my husband and I moved to Virginia Beach about two years ago from Burke where we lived for 14 years. We love “the Beach” but miss our friends in No. Virginia. I so enjoyed your Website. You should be very proud! also the Richardson Family Jazz Band photo. http://jodykruskal.com/concertina_gallery.html where you can also hear the music I play. The concertina I play is from that time (1885 or so) and Harry’s concertina looks much the same as mine does. Perhaps also made by Jefferies? Do you still have it? Would you mind if I were to include both of Harry’s concertina photos in my online collection? If you are willing, I would just copy them from your site. My use would be for noncommercial purposes only. There is quite a community of concertina players on the web. Many of us are interested in the old photos and other evidence, stories etc. from back in the golden age of the concertina. Hello. I am trying to trace my grandfathers family and wondered if you could help. His name was Ronald Kaye (maybe William Ronald) He was adopted and his real mother was Florence Richardson. She was young and handed him over in a catholic church when he was 6 months old (1917ish). Im not sue if she was married but her and her partner were musicians and her only request was that he was to be brought up musically. He was a very good pianist I can remember but I was 4 when he died suddenly. Anyway my mother has the birth certificate to see dates etc and i think adoption was somewhere in Suffolk (my grandmother may have village name)but all info seems to have been withheld by his adopted mother who is now dead and never married. I know she spent some time in America. If you have any information on your research of the richardson family i would be grateful. Thank you. While reading My Via Ancestry.. I noticed we are related through the Norvells! My great, great, great, great uncle George. (is that 5th generation or 6th?) I also see direct lineage from Anna Norvell (married to my Benjamin Johnson) up to Captain Hugh Norvell. I’d love to know more about him.. and his ancestors!! How did you find this information? I’d love to know more. Please email me! Thanks. Comments on the Norvells are HERE. Regarding the RICHARDSON family, we have one Florence RICHARDSON, however in 1917, she was Florence HEMING, married with two children, living in Canada. She never lived in the United States and visited England only once, after emigrating, and that was between the two World Wars. She seems very unlikely to be related to your Florence RICHARDSON of Suffolk. I am a decendent of Michael Woods and Archibal Woods. Would like to know if you have any information on the Woods family since I see where Archibal sold land to you decendents. Sharma Woods Akin – Michael WOODS arrived in what is now western Albemarle County about 1734, with a band of Scots-Irish from Pennsylvania. Countless descendants of his yet live by the old Indian trail that he named Woods Gap, and which is now called Jarman’s Gap. I don’t know Alexander WOODS other than, as you say, he was involved in land transactions in the area early on. So glad that Violet keeps in contact with you. So I started looking through your beautiful web site. Vi said something about a picture of my mom holding baby Ivy, at mom’s 94th birthday. Did you post the picture on this web site? Also, I noticed that date of death was listed incorrect. William F. Sanders died January 10, 1990. Hope you and family are fine, those grandchildren are the greatest. We can enjoy them even more than our own! Mom is healthy, except for her eyes. She gets very lonely and tired. That tired thing comes quickly now for us too. Looking forward to hearing from you sometime. a rich source of information relating to Sheffield, England and the first world war. I just purchased your book about the Peytons along the Aquia. I have been working on the Peytons of Stafford County for many years and noticed some differences in your book in regard to the early lineage published by the Peyton Society. My concern is in regard to the ancestors and descendants of Charles Peyton, son of Evan Peyton. The Peyton Society gives the lineage as Charles, son of Evan, son of Charles and Diana, son of Philip, son of Philip and Mary (Rush), son of Henry. Your book gives the lineage as Charles, son of Evan, son of Philip and Diana, son of Valentine, son of Henry. You indicated that Henry’s son, Philip, named devisees in his lost will of Philip and Charles Peyton, whom you believe are nephews (sons of Philip’s brother, Valentine Peyton) rather than his sons. This belief is partly based on the deed of gift of Philip to his brother, Valentine, which mentions Valentine’s six sons. Another thing that may support this conclusion is that Philip married Mary Rush, whose sister, Elizabeth Rush, married Joshua Hudson, and had a son Caleb Hudson who apparently married a Miss Peyton of this line. Since Caleb left a long line of descendants named “Valentine Peyton Hudson”, Caleb’s wife was likely a daughter of Valentine Hudson. With the common practice of marrying first cousins at that time, one would normally assume that Caleb’s wife was a daughter of Philip Peyton and Mary Rush, but in the case of Philip not having any children, his closely associated nephews and nieces would then be the closest contacts of that line to the Hudson descendants of Elizabeth Rush. In regard to Philip Peyton being the husband of Diana, who was later the wife of William Simpson, do you know what the Peyton Society based their statement on that Diana was married to Charles Peyton? I noticed that you gave the wife of Evan Peyton as Anne Carter. I can prove by the tax lists that her name was Anne, and the Carter maiden name would explain the presence of that name in the family as a middle name in later generations. There are also stories passed down in the Peyton family of the Carters. Evan’s son, Charles Peyton, had a wife, Elizabeth, whom you also stated was a Carter. That does not appear to be correct. Everything points to Elizabeth being the daughter of Thomas and Priscilla Roberson. You stated that, per the Revolutionary Pension records of Charles Peyton, that his heirs were the children of James Peyton. Please recheck your records on that, as the heirs of Charles were his own children (Thomas, Valentine, and Nancy/Ann), not the children of his brother, James. The letter of Nancy “Payton” Limbrick, daughter of Charles Peyton, is in his pension file and clearly shows that she is his daughter, not niece. If Charles Peyton’s heirs were the children of his brother, James, he would not have been the father of the children you have listed for him, and we know that he actually was their father. Nancy Payton Limbrick and her husband were murdered by her cousin, John T. Roberson, per the newspaper account. John T. Roberson was not the son of George Roberson and Anne Peyton, as you have stated, but was the proven son of John Roberson (and Maria Rogers), son of George Roberson and Fenton Jett. George Roberson was the son of Thomas and Priscilla Roberson. John T. Roberson was a cousin to Nancy Payton Limbrick because his grandfather was a brother of Charles Peyton’s wife, Elizabeth Roberson. Anne Peyton, whom you have stated was the wife of George Roberson, was actually the old maiden sister of George Roberson. Anne Roberson died in 1813, per the White Oak Primitive Baptist Church Records, and a story has been passed down regarding her death. I just wanted to make sure that the information presented was correct, as I have just had correspondence with another purchaser of your book who has become very confused because of the discrepencies. Thanks for your great contributions on this family. Hi Bill, thank you very much for purchasing my book. The corrections that I have made thus far are published here: https://neddysnook.wordpress.com/peytons-along-the-aquia/ . Are you unaware of Frances Peyton (10 Oct 1796-17 Nov 1871), dau of Lewis (Philip, Valentine, Philip, Henryx3) Peyton and Winifred Followell; mar John Milton Tuell 18 Feb 1819 and reared family of 10 children in Harrison Co, IN, or have you reason to believe Frances is not the child of Lewis and Winifred? The first son of Frances and John Tuell was named William Lewis Tuell (1827-1906) and called Lewis, and the second son named Bluford Peyton. Additionally, John’s first cousin, Jesse Tuell, mar a Nancy Peyton 8 July 1798 in Louisville. I’m truly interested in your thoughts. Thanks. Gwynne – I have no reason to state that Frances is not the child of Lewis and Winifred. The only child I can truly document of Lewis PEYTON is Nelson PEYTON. I am certain there were others, and I have not done the research needed to find them. The Peyton Society of Virginia lists thirteen children in their 2004 book, but they do not document them. NSDAR records document only Nelson PEYTON. I came across your old blog, and was redirected here. Two things. Atheism is not a form of religion, since it is not accepted on faith. It is a default position. In science, the burden is upon those who present a hypothesis gather evidence to support their position. To say that atheism is a religion is comparable to saying that I accept on faith that a dog cannot speak English, because I have never seen him do so. If you were to claim that dogs speak English, I would ask you to provide evidence to prove your position. If that evidence is not provided, then I have no reason to believe your assertion that dogs can speak English. Looking around at flower and butterflies and sunsets is not sufficient evidence of God. You have a point that atheists cannot prove that there is NOT a God, which is why the agnostics win this one, but I’ll still stick with atheism since it is a default. Atheists are not afraid to speak up these days either. Religion may have gained more media attention recently because of the surge of evangelicals into the political public sphere, but this does not mean that more people are converting to Christianity, we just have to hear about it more often. Literature by noted atheists such as Richard Dawkins, Christopher Hitchens, a Sam Harris have become quite popular, and have been given attention by mainstream media. Just because one chooses to surround oneself with what one is comfortable and familiar with does not mean that another point of view is fading. The next thing is that you posted an artist’s creation of what a Neanderthal child might have looked like – red with freckles and light eyes. Then you noted that the Vikings may have descended from Neanderthals. This struck me as quite nonsensical, since Vikings are part of the species Homo sapiens sapiens, which is the only human race in existence today. All H. sapiens, including Vikings, are the same species or “race” as those peoples in Africa, East Asia, Native Americans, Native Australians “aborigines”, and any other regional groups you might think of. So no, Vikings did not descend from Neanderthals. This is an example of convergent evolution in which two different species evolve similar traits because they share a similar environment. An example of this would be whales and fish. Whales are mammals, very unlike fish, however, whales and fish are similar in shape and form (ex. both have fins) but are not related whatsoever. Another good example would be birds and bats. Anyhow, I thought I might assert my two cents on those points. Feel free to check out my budding blog and leave your own opinion. Elyse – I NEVER said that Vikings were descended from Neanderthals. I raised the question “tongue in cheek” because of the red hair and freckles? Since almost all Europeans are descended one way or another from the Vikings, that would make me, my family and almost all of my friends — Neanderthals. I would never say that nor think it! We have talk before but it has been a long time. My grandmother was a Hackett and I have alot of old pictures and don’t know who they are. Maybe you do. I also have info on my Hackett line if you want. E-mail me anytime. Would love to hear from you. Hello Neddy. Found your website a few minutes ago and I’ll be back. It is now among the list in My Favorites This is Mary from Meander With Me. I agree: blogsites are much more interesting with pictures and photos, but can’t do it with AmiPro. I hope you can help me. I am trying to research my husbands maternal line, Rhea. He knows very little, when I started researching for him he didn’t even know his grandfathers name. I have since determine that his mother, Helen Lee Rhea’s parents were Harry Lee Rhea and Mary Maud Tolley; Harry was born in 1887 in Va. not sure of the county. His father was John Rhea, born in 1840, Harry’s mother was Susan A. Forrest, John Rhea’s father and mother were John and Virginia. Most were from the general area of Washington Co., Augusta Co., Bath Co.
Can you possibly connect me any further back than Harry with definite info. and I would also like to know if Harry’s father was in the civil war. I sure hope you can enlighten me or at least point me in a profitable direction. These people are all in the census records I am sure. A transcript of the 1880 census is on line for free at familysearch.org. Many county libraries in Virginia have copies of the Virginia censuses on microfilm. Ancestry.com also has them, but for a fee. Hi – I visited your website whilst looking up Primrose Day. I love the picture of the young girl with primroses. My Father was born on Primrose Day and as a young girl in Salford (near Manchester) sixpenny bunches of primroses were always on sale on that day. We always thought that Dad was born on a special day and he always had primroses or something decorated with primroses from us on his birthday. I was more than delighted when my daughter was born on the same date and she was always his “Primrose Girl”. We tend to collect ‘primrose-ibilia’ and all my family regard the day as special. Coincidentally my parents moved to Moston (from Salford), the next neighbourhood to Blackley which was mentioned in your website in relation to Teddie Richardson. Also coincidentally my daughter was born the year of Ted Richardson’s death. I have enjoyed reading that other people see the 1th April as important. I’m now living in the Midlands and no one here seems to know the significance of the date. Thank you for the lovely & interesting site. Well, Lesley, I think we should adopt you into our Richardson family. I did not know exactly where to contact you. 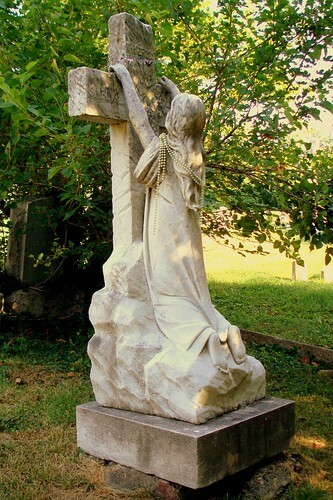 I found a website with a statue, of a woman clinging to a cross that linked back to you as the photographer. I would really like to know where the statue is, and if you have any information about the artist, or when it was done. Hope this makes sense! I am a descendant of Dr. Valentine Peyton and would like you to contact me. Thanks! Julia – I am sorry that you did not get my very lengthy email response. However, I have learned a good lesson and it is why I have created this Guest Book. Here I can answer questions without having my very detailed emails bounced because I am considered a SPAMMER. I read with interest your page on “The Forgotten Folk of My Virginia Families”. I can confirm a point you have suggested. I am a grandson of F.H. (Frank) Peyton, son of John Wesley Peyton, son of Benjamin Peyton, son of Nancy Peyton, and I was delighted to see our line detailed in your “Peytons Along the Aquia” masterwork. Thank you! I have a letter from my Grandfather Frank, who was born May 1862 in Front Royal, VA., wherein he describes life as a child on Grandfather’s (Benjamin) plantation near Washington Va.
…Is exactly correct, according to my Grandfather’s letter. I hope this little detail helps remember some of those “Forgotten Folk”. Thank you very much for that additional information on the Culpeper Peytons. Benjamin PEYTON was the brother of my 4th great grandfather, George PEYTON, who went on to Spotsylvania County. The family of your Benjamin is on pages 148-150 of “PEYTONs Along the Aquia.” The family of my 4th great grandfather George PEYTON begins on page 145. Hi, I do not know whether you can help or not, but I am trying to find out any information that I can about a relative George Secker. He died on the 31/07/1927 and was interred at Ladywell cemetary. I am afraid that I do not have any other information not even a grave number. Any help would be appreciated. Hey… sorry for my english, where I can download XRumer 5.0 Palladium FOR FREE??? Thanks!!! Love to read your website. I’ve just discovered it. Most likely we will buy your book. In the meantime I thought I’d post a comment here. My husband’s family is descended from the brother of your Lucy Peyton; Minor. His son George H. (Harrison?) Peyton is in your index, but not his wife Anne Elizabeth Leathers, so I don’t believe you followed this part of the Spotsylvania line. The last of their nine children was Leona Peyton (b. Aug. 1884) who married Robert Ryland Humphries. (This is all from Spotsy courthouse /marriage & census records). Happy to meet you Cousin D. I have a “Second Edition” coming out of “PEYTONS Along the Aquia.” Although there is much additional information and corrections, I did not follow the line of Minor PEYTON’s son, George H. PEYTON. But his ancestry is in the book, back to Normandy. the new “PEYTONs Along the Aquia” should be in print within the next couple days at http://lulu.com/ednabarney, and will be available in a hard cover edition too. My suspicions about the Humphries (also spelled Humphrey) is that they are connected to the Spotsylvania County Peytons through the Guinn (Gwynn) family. I have no proof – only suspicions. Joy Naylor Ryckman recently sent me two reports that you did on the Naylor surname back in January and November 1995. I wonder if you remember this work and if you have any other information related to this work. Joy and I are both descended from George the Immigrant Naylor. More recently, I am descended from James George Naylor (b. 9/2/1820 – d. 10/27/1902). He was born in Prince George County, MD and died in Washington, DC. I know that he was a builder, mainly of public buildings in DC. I have a great deal of informtion about him but do not know who his parents were. If there is any information about him, or any other Naylors in your files, I would certainly like to know about it. Tom – I’ve not done any research on the Naylor family since that time. I don’t know the James George NAYLOR that you are descended from. Do you know his grandfather? The technology in mobile phones has improved rapidly this means many users are upgrading to new mobile phones each day. We all have an old phone someplace in the household that just gets in the way. But its these old and unused phones that give you a immediate money boost.. Mobile phone recycling gives you more than a bit of money, because you will also be assisting to protect the environment. Virtually all mobile phones contains severe noxious substances which can do a lot of harm to the environment if not processed professionally. But did you know, you can even sell your broken mobile phones to! Your fundamentally getting money to help protect the environment. There is a wide selection of companies you can use for mobile phone recycling. You should know that prices can alter greatly between the different mobile phone recycling companies. I would recommend checking round for the better price. Getting money for your phone is simple, filling out a form will get a prepaid envelope sent to you. Pop your mobile phone in the envelope, seal it and mail it back, in just a few days you will recieve a check for your phone. Im going to show you how easy it is to get the best price for your old phone. A mobile phone recycling comparison website has been made that allows you to compare all of the prices in just one click. Cynthia Vance has reopened Henry Peyton’s line in the DAR and submitted HR 1150. I have composed the following for press release and would appreciate your comments, changes or additons. Your book helped support the application tremendously. I do not know if you have corresponded with Cynthia Moody Parnell, AG who helped put the application together, but should would be pleased to hear from you. In the beginnings of our great republic, the capitol building in Washington, DC, housing the congress, was called the “people’s house”. Citizens could bring grievances with their government, no matter their station in life, for a hearing. Such was the case of Private Henry Peyton, born January 19, 1760 in Culpepper, Virginia. As did many adventuresome youth of his day, Henry joined forces with country cousins, brothers, uncles and fathers, rebels all, to attend the front line and watch the defeat of King George and his superior forces. After the war, Henry Peyton and his family were some of the first settlers of Cabell County, West Virginia, responsible for many local descendants. In the 1830’s provision was made to grant pensions to all that gave evidence of service in the “Great American Revolution”. Henry submitted his statement of service and was given recognition and pension, as a veteran of the war. All appeared well, until claims of fraudulent petitions were filed with the government office and investigations took place. Henry seems to have been a colorful character at the local tavern in Barboursville and perhaps a bit boisterous concerning his war exploits. Loud talk of one’s heroism was considered the rudest of manners. Stiff necked neighbors gave a bad report to the investigator and Henry’s submission as a Revolutionary War patriot was stamped fraudulent. Henry, understanding the rights for which he had fought and for which many had died, began petitioning recognition and justice from the government. With the help of an affidavit from magistrate W McComas and other good citizens’ recommendations, the government was finally convinced of the injustice toward Private Henry Peyton and on February 16, 1839 HR 1150 was passed by the House of Representatives. A history of Henry and his letters may be found in the “Lambert Collection” housed in the old library building on the campus of Marshall University. Henry‘s resting place is Henry Peyton Cemetery in Barboursville, West Virginia. “As of today, even though a number of descendants of three different children of Henry Peyton had joined the Daughters of the American Revolution (DAR) under his Revolutionary War Service, his line has been closed, as the statement of fraud has been “rediscovered” in his pension record. Once again as genealogists, we see how difficult it is to correct errors of many years ago that were put in “official” writings. The family and descendants of Private Henry Peyton are very pleased to announce that on October 3, 2009 the DAR reopened Henry’s line through application by Cynthia Alexandra Vance and her presentation of HR Bill 1150. Cynthia is the sixth great granddaughter of Henry Peyton. Cynthia is a 19 year old college student in San Diego, California and now the newest member of the Cahuilla Chapter of the National Society Daughters of the American Revolution, in Palm Springs, California. Cynthia’s grandmother Louella Vance, great aunt Rheabel Vance and cousin Aimee Vance Cartwright all reside in Barboursville. Cynthia’s first application to the DAR was by way of her fifth great grandfather Abner Vance. Unjustly hung for murder in 1819, versions of Abner’s story may be found on the internet. Abner Vance is the great grandfather of Devil Anse Hatfield and the great-great grandfather of Jack “Manassa Mauler” Dempsey. At one time, the DAR recognized Abner’s descendants through Logan County historical references, but his line has been closed because of lack of sourced documents. To become a member of the DAR, documentation of relationships has become critical. There are thousands of local and family histories which have been used for membership. These histories are no longer acceptable by the DAR without proper sources. “To become a DAR member, any woman age 18 years old or older must prove lineal descent, regardless of race, religion, or ethnic background, from a patriot of the American Revolution. The patriot might have been a soldier, sailor, or civil servant. The DAR was incorporated in 1890 as a service organization to promote patriotism, historic preservation, and education. More than 860,000 women have joined DAR since its inception. In the almost 120 years since it began, DAR has become tougher on its admission standards in terms of what makes up valid proof of lineage. There is so much misinformation swirling around on the internet, and in family histories in general, that DAR is currently not only in the process of proving new connections, but also in correcting misinformation. Cynthia Vance’s lineage to her 6th great-grandfather, Henry Lindsey Peyton, was proven through a variety of source documents. Census records dating back to 1860 proved many parent-child relationships. Birth, marriage and death records provided dates and places of residence, as well as family connections. Records prior to 1850 were harder to come by, because census records pre-1850 only show heads-of –households, not the names of other family members. So, the use of West Virginia church and cemetery records helped to connect Peyton family members together. My name is Paul Stinson and my great aunt was Sue Annie Stinson who lived her entire life in the family home off the courthouse square in Jonesboro, LA which is in Jackson Parish. One of her brothers was my grandfather, Ed Walker Stinson, SR. My father was Ed Walker Stinson, Jr. and my son is Walker Paul Stinson. My great grandfather was Alexander Stinson who married Alice Talbot. They are all buried in Jonesboro, LA in the old cemetary. My father was the only male child of this family and died in 1990. He had only 2 cousins-both wonderful ladies. Mary Jo Gautreaux O’Quinn is still alive and in excellent health living in Alexandria, LA.Mary Jo has two sons. Dean Stinson Clarke recently passed and has two daughters. Aunt Sue was the family researcher, and researched our family back to Buckingham County. My brother and I are the only surviving males from this family to carry the name Stinson forward. He has 3 daughters. I have one son-Walker- and a daughter-Annie. My brother is the eldest and is in possession of the family bible which Aunt Sue gave to my father which records the family geneology back to Buckingham County. Has someone copied your family bible? I would be interested in seeing how your family connects to the STINSONs of Buckingham County. Please explain, as I know not to what you refer. Great addition here, thanks for sharing and good luck with your work! I am African American, born in Richmond, Virginia/Henrico County, and seeking answers to many questions regarding my family’s various ancestral lines and connections to specific Virginia plantations, namely Berkeley Plantation in Charles City, Virginia. Peyton is my paternal grandfather’s surname, and three of my father’s ancestors carried the name Benjamin Harrison (Peyton). I am specifically looking for slave records and other info that may shed light on their connection to the Peyton and Harrison families and to specific plantations. I understand that most white Peytons were early tobacco planters. My great grandfather James Walter Peyton (born around 1913) was son to a Benjamin Harrison Peyton and Carrie Peyton. I have no information on their birthdates or specific birth locations. Most of my family members remain in Virginia, either in Richmond City or in the Varina/East End area of Henrico County, within 15-20 miles of the James River Plantations. Any guidance you can provide is greatly appreciated. @ LPEYTON — I see your 2nd great grandmother Carrie PAYTON on the 1920 Census as a widow. Her husband would have died before this date so you should get his death certificate from Richmond. It should show his parents. There were really not many PEYTONs/PAYTONs in the Richmond area, but in surroundings. Henry PEYTON of Albemarle County had a son named James Walter PEYTON born 1831. These PEYTONs were descended from the HARRISONs of Northern Virginia, but Henry did not use that name for any of his ten sons (one named Benjamin). I have found only one slave record for Henry – Slave Alice was born in 1856, in Albemarle County records. Henry was wealthy, so certainly had more slaves. Your ancestor “Benjamin Harrison PEYTON” was possibly named for the HARRISON family of the James River Plantations. The “white” Henry PEYTON family is covered in PEYTONS Along the Aquia.” I do not recognize any of your other names as connected to these PEYTONs. I am interested in the Vires/Via family name. My great-grandfather was Hughie Vires. The website I posted is that of a memorial I made for him along with his photo. I made one for his dad Moses Vires and I found his wife Mary Robinson and connected my family to her as well. I have requested a photo of their graves. They were buried in High Top Cemetery in Breathitt Co in Jackson. I traced him all the way back to Amer Via. You said that your great-grandfather was Jack Via? I have a Jackson Vires who was my great-grandpa’s brother. Could it be that my Jackson is your Jack? Please contact me. I would like to know if this is our connection and I would love to find out where all the Vias/Vires are buried as well as any information I can get. I have done extensive research. I have a John Via who married a Powhatan girl named Mary. I would like to know if my family has a Pocahontas connection. My dad had a tattoo of her on his right forearm and always claimed she was in our line. So far all I have found is Mary. My dad’s story was passed down from generation to generation. I love your website by the way. Jan – Who did your father say he was related to Pocahontas or Mary, the Powhatan girl? My great grandfather’s nickname was “Jack” Via and I don’t know why. His real name was Matthew Via. Mary was a member of the POWHATAN Tribe. The same tribe as Pocahontas thus starting a LINK to the NATIVE AMERICAN that persist to this DAY. I don’t see a Matthew Via. Can you give a me a rundown on your line? I am George Crosby – GGson of George Haslep Crosby who married Mary (Marietta) Via (2nd Husband) – She is Daughter of Rueben Via – Son of William Via – Son of Micajah Via – Son of William Via (b. 1704) All of Albemarle, VA.- Goes back to William I of Scotland and beyond…. George – I do not know of George Haslep CROSBY. How did you find their marriage record? I have Marietta married to Richard Henry OGG. How did you find that this VIA family goes back to Scotland? Thanks. Im A direct decendent of James Iverson Boswell his Grandson i live on the Boswell Property that has been passed down for the last 170 yrs what exactly are you looking for? He Moved to Marshall county here where they settled the area in the 1830’s and built the plantation home we still live here now. Your historical work is awe-inspiring. So vast and deep. Thank you for designing such a useful, entertaining and educational website for all the world to enjoy. I have been blessed to tramp alongside you on a few of these paths. You inspire me to keep doing this work that I do, hoping that it will be a light along the path of another as YOUR light has been for mine. God bless you, real good! I am William R.Peyton GGgrandson of Joseph Peyton, who married Jemima Nelson Jan., 1805 in Bourbon County, Kentucky. Both listed their place of birth as Virginia. If I remember correctly, family history recorded his father as a Valentine Peyton. Jemima died in Kentucky abt. 1820, and Joseph, two daughters, and four sons came to Cass County, Missouri abt.1836. Joseph and all four of his sons are buried in the Nelson-Peyton cemetery. I am still trying to confirm Joseph’s parents and siblings. I have a copy of the original Peyton’s along the Aquia, but have not as yet seen the 2nd edition. Hope to find more information there. Wm. Roger Peyton – Thank you for purchasing my book. I am sorry to say I have no information on the family you cite. I know of no VALENTINE PEYTON with a son named JOSEPH PEYTON. The only thing I found in my database that you may want to pursue is a JOSEPH PEYTON mentioned as a grandson in the will of JOSEPH WHITSON, Washington County, Tennessee. JOSEPH WHITSON named his sister “SARAH NELSON” and “HENRY NELSON” was a witness. The will was dated 1 November 1790. I know nothing more of these people. You may also want to check out my blog post about Joseph PEYTONS of Illinois. Good Luck. Thank you for the information on Joseph Peyton by way of the Whitson family. From what I was able to locate from that was Joseph was a grandson of William Whitson jr. His father was a John Peyton and his mother was a daughter of William Whitson. It would of have been Joseph’s grandfather who was a Valentine Peyton. Actually Roger – I do not know who the father of either Joseph PEYTON was. The Joseph PEYTON in the 1790 Tennessee Will was the son of a Miss WHITSON and related by marriage to the NELSONS. Both NELSONS and the WHITSONS are found in Overwharton Parish of Virginia, so that is presumed to be the birthplace of his PEYTON father also. The Joseph PEYTON who married Jemima NELSON were both from Bourbon County, Kentucky and DAR records that as their birthplaces. I do not know the parentage of this Joseph PEYTON either. How do you document that Joseph PEYTON’s father was John PEYTON and that his grandfather was Valentine PEYTON? I have no record of that, but I will research further if you can provide documentation of it. Hi Neddy: I just got your 2009 book, and am enjoying it hugely. I am pleased that you find John Peyton (wife Ureth) to be son of Charles Peyton who is son of Philip Peyton and Mary Rush. I had guessed this to be the case, but would like to solidify it. Can you share with me your rationale? Thank you for purchasing the book and I am happy you are enjoying it. I have presumed John to be a son of Charles and I have cited my reasons in the text of the book, which include locale, perpetuating of the name “Charles” and the Scroggins (Scrogging) family which seems to occur in both the John and Charles generations. The documentation I used for Charles as a son of Philip is on page 205 under “Bibliography and Sources.” I have not come across any additional evidence since writing the book. Thank You for the comments regarding Joseph and John Peyton. After some additional research we find Joseph’s name was Joseph Daniel Peyton and may have recorded as J.Daniel or Daniel Peyton. His father was John Peyton, but probably not the John that married Whitson or Lunceford. Our John Peyton was born abt. 1751 s/o Henry Peyton b abt. 1725 s/o of Valentine Peyton b abt 1680. We find our John Peyton on the tax rolls in Bourbon County in 1794 and 1799. Joseph and Jemima Nelson had four sons, the oldest, Horatio was probably named for the Nelson side, the next Henry named for Joseph’s grandfather , the third John named for Joseph,s father and the fourth, Edward Nelson, named for Jemima’s father. We are still researching John, but this appears to be the line. If you find any additional information, please let me know. We just got your 2nd edition book Peytons Along The Aquia. We LOVE it!!! Not sure if any of my Peyton family is in there yet though. My grandfather was Ephraim Peyton born in Virginia about 1899 and his father was Ephraim Peyton born in Greene County, VA about 1860. We think his father was James Peyton born in Virginia about 1825..with his parents listed as Jeremiah Peyton and Margaret Elisabeth Crouch. Was wondering if you had any info on them or if you can point us in the right direction. We (my daugther and I) are very new to family research…but it’s very addictive and we LOVE it!!! Thanks so much for the book and any help you might be able to offer. Connie – Thank you for purchasing my book. I don’t remember if I answered your question or not, as I no longer check this blog very often. I do not believe that James PEYTON, son of Jeremiah PEYTON is your ancestor. I don’t think that he ever married. This is who I think your ancestor is: http://peytonbook.blogspot.com/2013/12/charles-peyton-of-culpeper.html. Neddy .. is your DNA kit on Gedmatch without an email? If so we’re trying to figure out where a match is between you and my cousin Connie P and another person BFByers. I sent you a message on FB (it will be in your ‘other’ folder. Would appreciate hearing back from you! Thanks! I think I uploaded my DNA test to Gedmatch, but I don’t understand how to use it. My username is “Edna Barney.” I cannot find your message on Facebook. If you can give me the usernames for Connie P. and BFByers, and whether they are at Ancestry or FTdna, I will look at their tests. Perhaps it is the Powell family of Albemarle County, Virginia. I have been searching for the link between my paternal grandfather Charlie Jackson Peyton m. Laura Ethyl Stanley. They lived in Kentucky, Indiana and illinois (Harco). I believe Cravin and Yelverton were family names. I would greatly appriciate any assistance. Please forgive any lack of procedure or protocol, I am new to this. Many thanks. PJ Peyton. I have photos should the help. Hello, Thank you for all of your research and information. I recently just found my link to the Peyton family and that I could be considered a member of DAR due to your research. My Grandfather William Henry Limerick is decended from Gustavus Limberick child of Charles Peyton Limerick son of Gustavus and Nancy/Ann Limbrick. I believe that Charles changed his last name from Limbrick to Limerick when his parents were murdered by his mothers cousin. I am a bit stuck on my Limbrick side but hope to reach back further on the Peyton side due to your reseach and discovering the Peyton society. Are you a member of the Peyton Society? I purchased your book a while back but have not sat down to read it. I also was always told per my mother that we were Irish on her side and I did the ancestry.com DNA test which I found out that we are actually Brittish and not Irish. I knew we must have had some Brittish ancestry but I am 43% Brittish. I love this search and it feels like being a detective. Thanks again for all your information. i am John and Ureth Peyton’s 7th Great Granddaughter. Do you happen to know Ureth’s Mother’s name?? I recently received my mtdna haplogroup of X2, and it indicates direct maternal line native american.